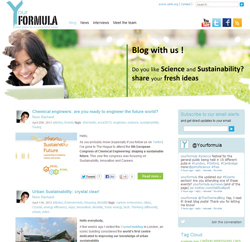 Yourformula.eu is an on-line platform dedicated to generating a dialogue among civil society, academia, authorities, and industry about the keys to building a sustainable future. The platform was created by the European Chemical Industry Council (CEFIC) to give young people a place to share ideas. It is maintained by a dedicated group of young scientists and communicators who are passionate about sustainability. “No single entity can build the future alone and everyone should play a role. No one has all the answers” says Nuno Bacharel <nuno@yourformula.eu>, chief editor at yourformula.eu. Through this communication platform, the focus is on young scientists and to find out what their expectations are. In addition to fun and inspiring articles, the site collects videos, news, and events, sharing innovations taking place in Europe and hinting at a more sustainable future. Follow YourFormula on Facebook and Twitter @Yourformula.